Madison Memorial is a strong, reliable health care system that continues to meet and exceed the medical needs of residents in a five county region. With the recent growth in the community, Madison Memorial has comprised an outstanding staff of caring individuals who are complemented by leading-edge training and equipment. In July of 2008, Madison Memorial completed a $55 million dollar expansion that tacked on 76,000 square feet of new space and remodeled 85,000 square feet of space. The addition included new and improved facilities in the areas of Emergency Medicine, Radiology, Laboratory, and Surgical Suites. The Family Maternity Center was also expanded with new family-friendly, post-partum rooms and a new Neonatal Intensive Care Unit (NICU). The Wellness Center doubled its space for physical therapy activities and has additional equipment.. 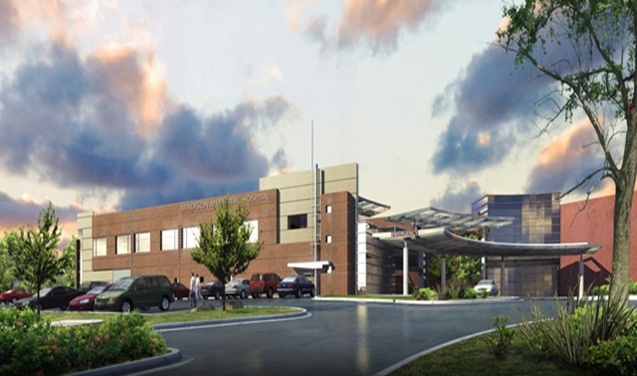 These updates, along with the new Paragon Café, have made Madison Memorial a highly favored hospital in the area. Apart from general and same day surgeries, their surgical department is also equipped for Orthopedic, Neurology, Gynecology, Ear Nose and Throat, and Spinal procedures. They also acquired a highly advanced operating table called the Jackson Table in 2008 that improves safety and comfort during spine surgeries. The hospital’s Short-Stay Therapy Department is also a great resource for chemotherapy as well as blood and iron infusions. With the hospital’s recent expansion, there are arrangements to bring in more programs and equipment, such as adding neuroradiology to serve patients requiring specialized attention. Madison Memorial is also making strides in neonatal care. In 2008, nearly 1600 newborn babies took their first breath in Madison Memorial Hospital—nearly 400 more deliveries than predictions for the year 2012. Madison Memorial met the need for a large maternity ward by expanding to make more room for mothers and newborns. The hospital has been able to keep infants at an even earlier gestational age than before with the addition of two neonatologists, and the NICU opened its doors in the Fall of 2009.